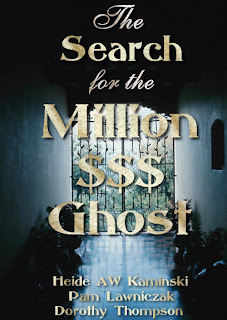 I designed and made the cover for THE SEARCH FOR THE MILLION $$$ GHOST because I love that control. As I had experience in cover design in the past, it only seemed fitting that I design the cover for this book, too. I’m a stickler about book covers. I didn’t want to take the chance on it being something that didn’t match what the book is about. THE SEARCH FOR THE MILLION $$$ GHOST centered around the Hawthorne mansion in which six lovely ladies tried their hand at ghostbusting. I chose the design because the Hawthorne mansion lied beyond a huge gate and when I found this picture, I knew it would be perfect even though in this picture, it’s really a gated window looking out. Where it’s moody, mysterious and foreboding, I thought it blended perfectly with the story. I’m happy with the cover and have gotten rave reviews for it. I love it that the picture gives off an eeriness that makes you curious of what’s inside the walls of the mysterious Hawthorne mansion where the majority of the action takes place. It kind of gives off an aura of mystery even before you open the book and that’s exactly my intentions when I created it. I don’t think another cover would have done it more justice. "Leave your tour in our hands!"